Mosquitoes are a bother to humans, especially during summer months and in wet or humid climates. For humans, usually mosquitoes are dealt with by using citronella candles and bug spray. However, mosquitoes can be a nuisance for your dog as well. Treatments used on humans are not recommended. Instead, try natural remedies you can make at home to keep your furry friend safe from mosquitoes. Citrus is a natural repellent to mosquitoes, ticks and fleas. Each time you use a citrus fruit, keep the peels for use in this homemade dog-friendly solution. Fill a pot with leftover citrus peels, such as from used lemons, oranges and grapefruit. Cover the peels with water and bring to a boil on the stove. Remove from the heat and allow the citrus water to cool. Discard the peels. Citrus water will not only make your dog smell fresh, it will act as a natural deterrent to mosquitoes and fleas. Essential oils will keep your dog smelling fresh and safe from mosquito bites. Consider adding in a few drops of essential oils to the citrus water mixture. Some oils are natural mosquito repellents. These include peppermint, geranium, sage, lavender, eucalyptus, lemongrass, sandalwood and patchouli. Pour the mixture into a spray bottle and shake well to combine. It may be a favorite of cats, but it is not liked by mosquitoes. To use the catnip, sprinkle a few loose pieces into the still warm citrus water and let it steep as it cools. Pour into a spray bottle. 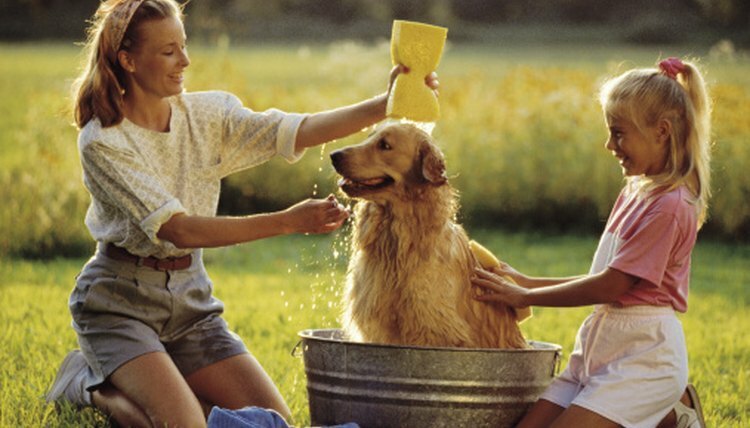 Before using the homemade repellents, bathe your dog. After you rinse away any soap, spray him with the citrus water, catnip or essential oil mixture. Spray along the dog’s back, legs, tail and hindquarters, as well as around his neck and ears where mosquitoes like to bite. Also, rub a few drops of essential oil directly onto the dog’s shoulder blades. This is an area where your dog cannot lick. The smell of these oils can be a powerful deterrent against mosquitoes, fleas and other insects. Periodically treat your dog with more citrus water or essential oils as needed. Keep a spray bottle full of extra mosquito repellent solution and spritz before taking him out on walks or letting him explore. Liza Hollis has been writing for print and online publications since 2003. Her work has appeared on various digital properties, including USAToday.com. Hollis earned a degree in English Literature from the University of Florida. Is Burning Citronella Candles Harmful to Cats? Is There a Natural Way of Getting Rid of Flies by My Dogs' Ears?